On a recent trip to Brentwood, the place made famous by ITV’s TOWIE, I popped into Gemma Collins Boutique to check out her latest collection and the gorgeous pieces in her shop. This peplum top immediately caught my eye. Not only is the mix of white and pastel pink perfect for the spring time, the shape of this top is fabulous, let me show you why. I love the shape of peplum tops and they look great on so many women but the ones that are a little more rigid tend to accentuate my middle and make me look larger which I don’t appreciate. However this peplum top doesn’t do that at all. It is very generously sized and although it has that gorgeous peplum shape, it isn’t rigid so it floats over my stomach rather than sticking out. There isn’t anything about this top that I don’t like and I’ve got to say that I’ve never had so many compliments on a top as I have with this one. The top portion around the neckline is laser cut and made of a different material to the rest of the top which is stretchy and textured. It is available in two variations, pink and mint and I couldn’t resist picking up both of them. I was wearing the mint one in town the other day and a lady actually stopped me in the street to say how pretty it looked which was a lovely confidence boost! The thing that I love about it the most is the way that the back is longer than the front which makes it ultra flattering and easy to wear with leggings like I am here as it covers my bottom… yes these are leggings! With having such dramatic proportions, I always struggle to get proper jeans to fit. My legs and bum are far smaller than my stomach so if I buy jeans to fit my tummy then they end up looking like bell bottoms. I can’t be rocking the 70s fared look every day so instead I like to opt for the New Look Inspire Denim Jersey Leggings. These leggings are an absolute staple in my wardrobe and I have been repurchasing them for years. They’re the only way I can truly get the look of skinny jeans and they’re so comfortable, I think I’d opt for these over jeans even if I could find some that fit well! I buy mine from ASOS as I am slightly addicted to their Premier Delivery service but you can also get them direct from New Look. To pull out the pink in the top, I added some pink heels, bangles and my Guess bag that I bought from the Guess store at the Safari Centre in Tenerife a couple of years ago. Just thinking about it is making me really wish I was on holiday right now! 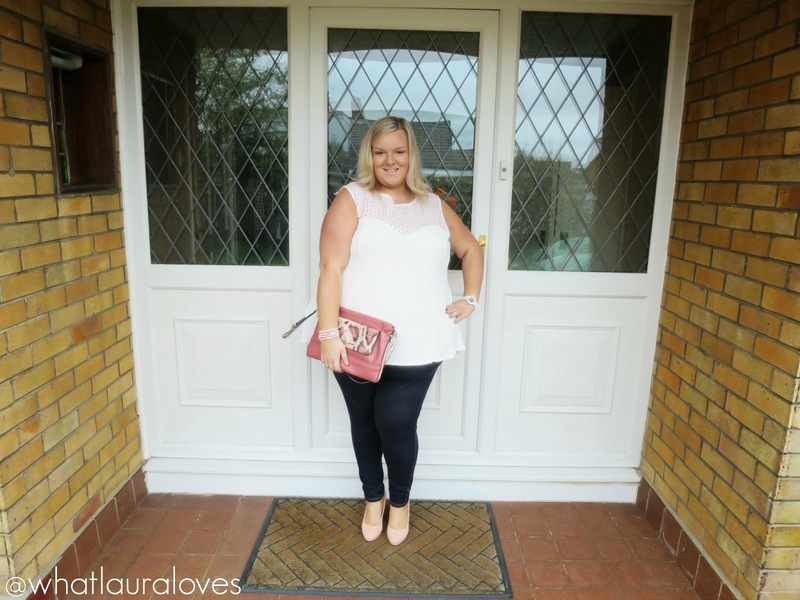 Do you love peplum tops? What are your favourite clothing shapes? That top and THOSE SHOES!!! 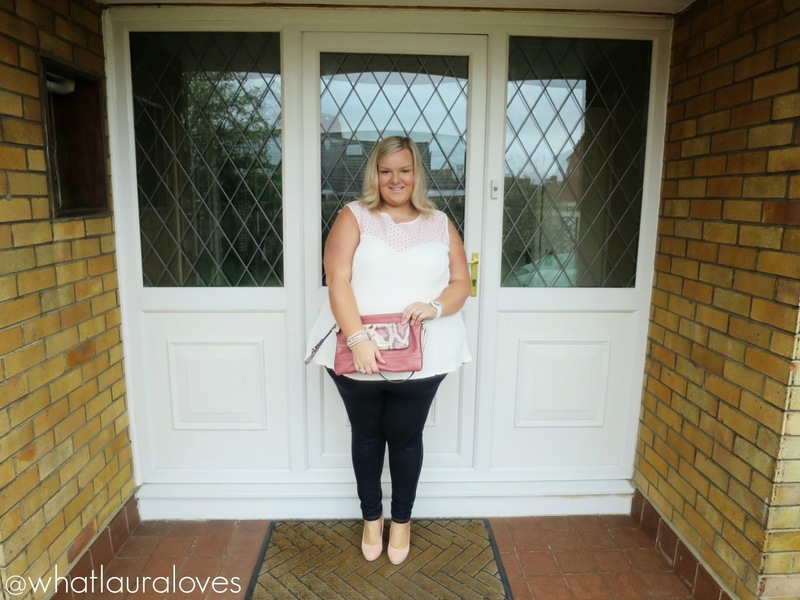 I want everything you're wearing in these photos, you look absolutely stunning Laura! Looking fabulous! I am so jealous you've been to Brentwood! aww thats such a cute and lovely look! exactly the right thing for spring time. Love the peplum! Love love love those shoes, they are so cute. The whole outfit actually!